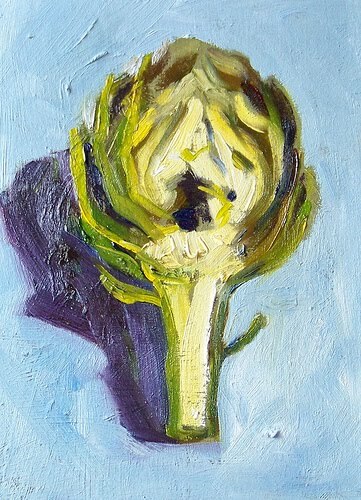 Perhaps I was deprived, but artichokes were never served at my house when I was growing up. It wasn't until I was in college that a friend showed me how to cook and eat an artichoke. Simple preparation that I couldn't leave alone. I fell in love with artichokes or perhaps it was the mountains of mayonaise that always came along with the treat. When I eventually found out how unhealthy mountains of mayonaise really was and that an artichoke wasn't quite as good without it, I quit eating them so often. But, this one made a great subject to paint. 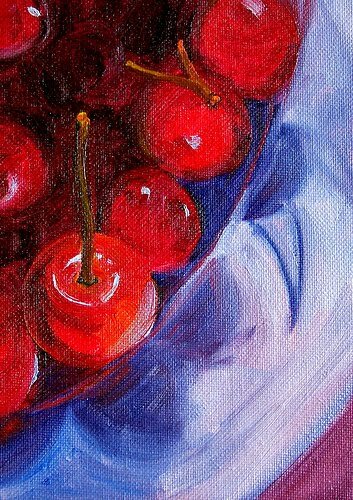 It is a 5x7 inch oil painting on a textured panel and is now for sale online in my Etsy Shop, Small Impressions. Clicking on this link will let you put in your shopping cart for $50.00 plus $6.50 for shipping to US addresses. Or you might check out some of my other small still life oil paintings. 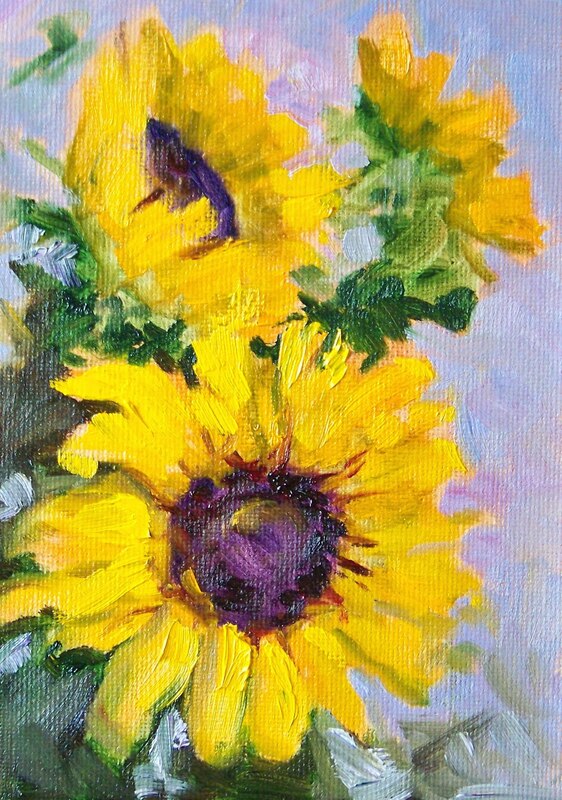 When the sun shines and the flowers begin to bloom, inspiration to paint florals sometimes appears. The sun was out briefly yesterday afternoon and inspiration arrived, too. Though they aren't blooming in the garden, it seems sunflowers are available at most of the local florists. I can see why Van Gogh enjoyed the subject. 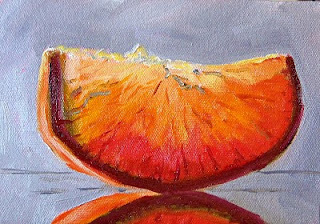 This painting was painting in oil and is 5x7 inches on a canvas panel. This guy had such a wonderfully peaceful look on his face, I just had to take some time and paint his portrait. His eyes glisten and he looks like he's wearing a grin. The painting is 5x7 inches on a canvas panel. 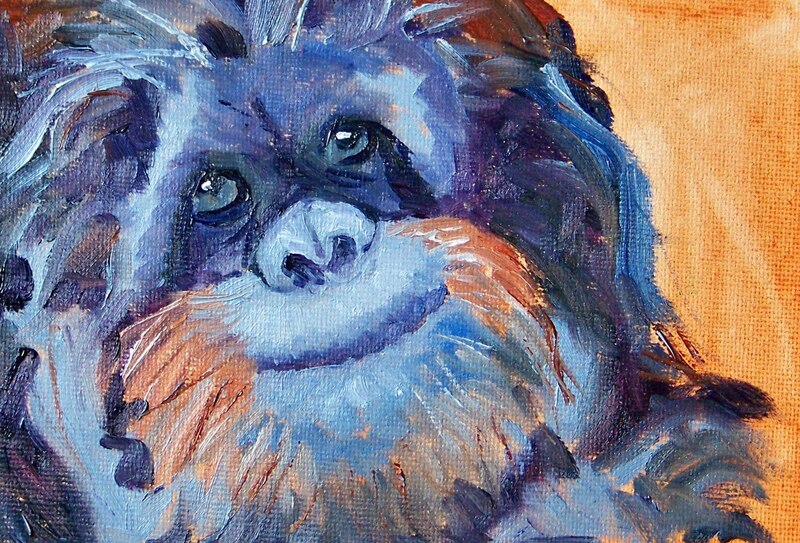 I used a palette of ultramarine blue, burnt sienna, alizarin crimson, and white. It was a great way to spend a Sunday morning. 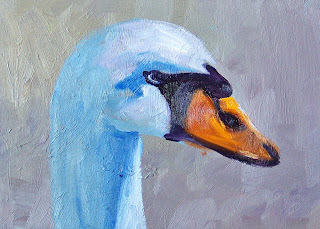 A goose or a swan? Are they the same or different? Everyone loves swans, but a goose has a different reputation. I'm not sure to which group this intense fellow belongs, but I am glad he has joined me in the studio. The warmth of the sun and his determined personality provided a great subject. He was created on a 5x7 inch hardboard panel with oil paints. Good-bye Cleo--I enjoyed your company! 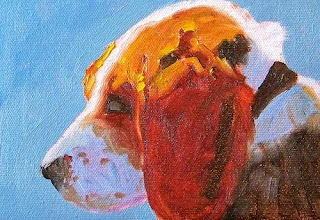 It is with mixed emotions that I say good-bye to Cleo, my favorite little puppy painting. Cleo is a 5x7 inch oil painting on a Raymar Canvas Panel. She has been good company, but has sold to a new owner and will no longer look at me while I sit in my studio and ponder. 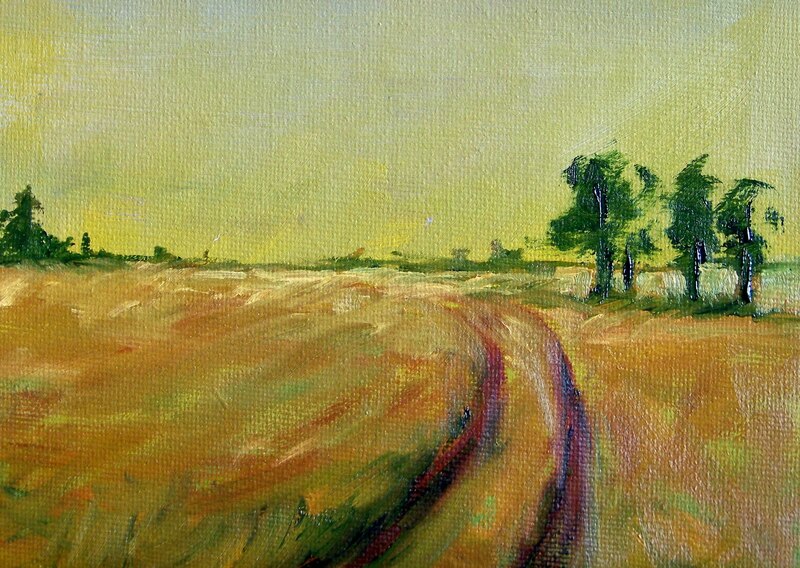 This little 5x7 inch painting came from a desire to get outside to paint. Unfortunately when the inspiration hit, it was pouring rain and the painting ended up coming from my imagination instead. 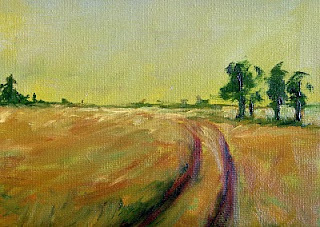 I'm looking forward to some warm weather and some plein air painting. Two bright red peppers on a black plate was my latest painting challenge. 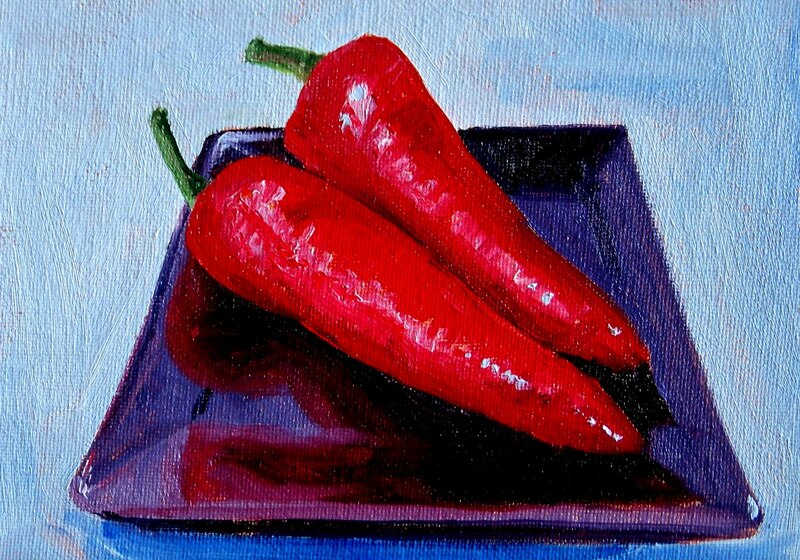 I loved creating the reflections on the black ceramic plate, but the bright red of the peppers mocked me. Red is such a powerful color, it is difficult to create the values necessary for a three-dimentional effect. I used Napthol Red, Alizarin Crimson, Ultramarine Blue, White, with just a touch of yellow and green for the stems. 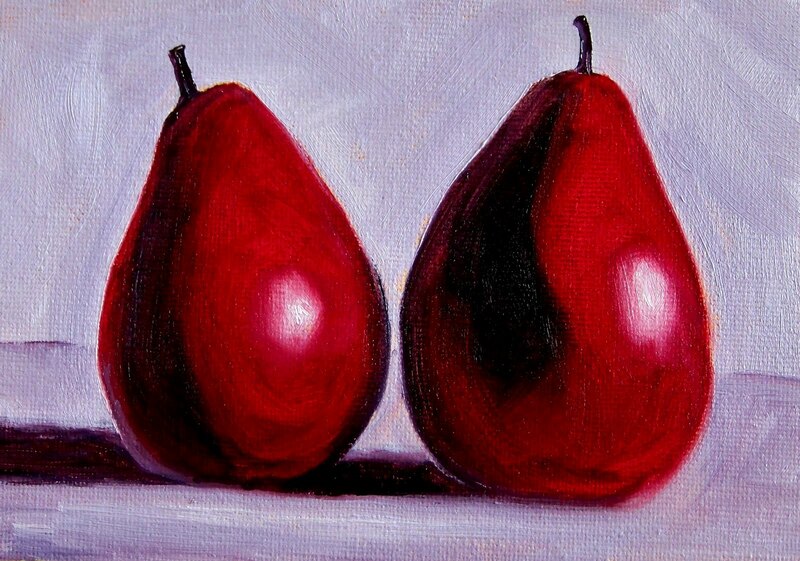 Creating a three-dimensional effect is a goal I am always trying to achieve when painting fruit such as these pears. It requires careful attention to the values, reflections, and shadows in each shape. Although the theory of creating such an effect is in my mind, every time a change in hue occurs, I am challenged all over again. Reds can be tricky, so I worked in red the past few days trying to get it right. Had some fun with red, white, and blue. I'm feeling pretty cherry and this little cherry abstract helped! It is for sale at the Small Impressions Gallery at Etsy for $35.00 plus $6.50 for shipping to US addresses. Painted in oils on a canvas panel. Click here to put it in your shopping cart. Painting this little 4x6 painting was especially fun. Working to create just the right color and the roundness of that seed is what I focused on as I painted. 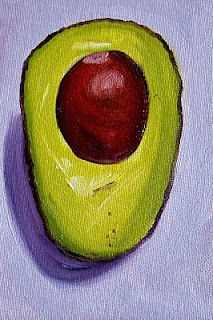 The wrinkled black skin of the avacado which can just barely be seen was another feature that gave the fruit its character and was a pleasure to paint. It is on the drying rack and will be ready for a new home in a few weeks. Even though there has been considerable rain lately here in the Pacific Northwest, April showers should be expected. It is almost time to start planting my garden and I need to remember it is the rain that will make the garden grow. I always grow tomatoes and zuchini and need to start turning over the soil. It won't be long until the fresh warm soil will be accepting my offering of seeds and small seedlings. 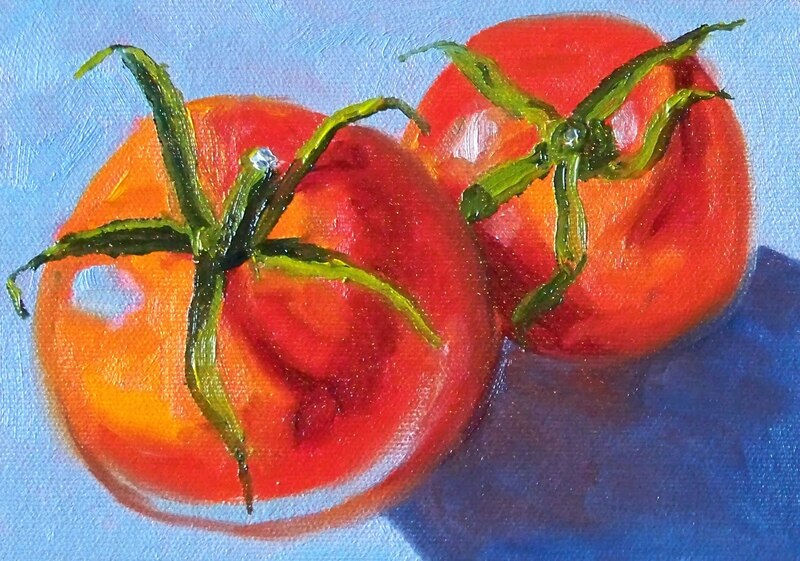 Today's painting celebrates the produce that will arrive after the tending of the garden. It is 4x6 inches on a canvas panel and displays a canning jar full of preserved tomatoes and some fresh ones, too. After days of rain, I finally found the sunlight. Several days on the Pacific Coast and it emerged from beneath the clouds and revealed a cool, crisp, but very sunny weekend. 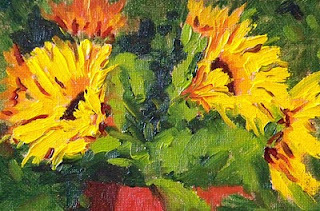 Celebrating the sunshine, I've put this little 4x6 inch sunflower painting in my Etsy Gallery, Small Impressions, where it can be purchased online for $24.00 plus $6.50 for shipping to US addresses. The Pacific Northwest is still muddled in a puddle of rain with no end in sight. In my quest for bright light and sunshine, I'm depending on my painting for warmth. 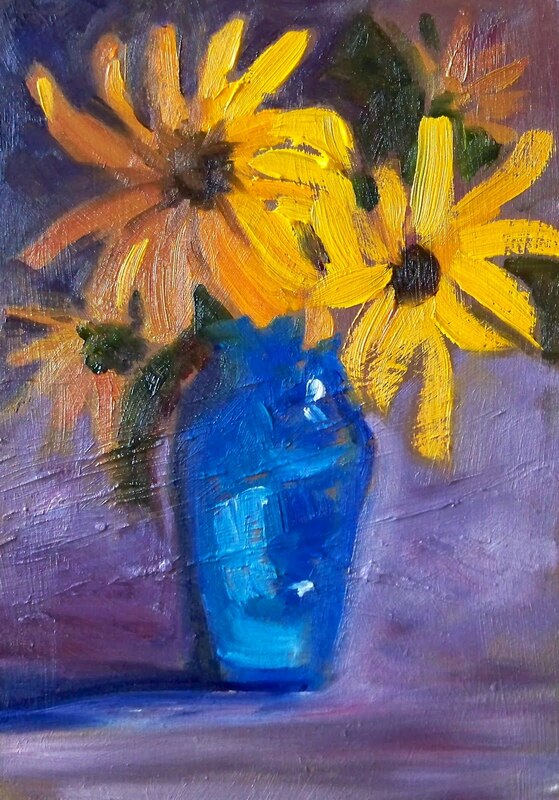 This little 5x7 inch oil painting is warm and colorful and was created on a Raymar Canvas Panel. It is for sale online at Small Impressions Gallery at Etsy for $50.00 plus $6.50 for shipping to US addresses. Just click on the Small Impressions link to put it in a shopping cart. With the windy, cold weather we've been experiencing for the past few weeks, I am in need of some sunshine. Unfortunately I can't travel to a warm place right now, nor is the sunshine importable, so I've settled for sharing this little slice of sunshine. It is a 5x7 inch oil painting on a Raymar Canvas Panel. It will fit easily into a standard size frame, so if you are also in need of some sunshine, you can purchase it online at this Etsy link for $50.00 plus $6.50 for shipping to US addresses. Today's painting was created about a month ago when I was experimenting with different supports for my paintings. This one was created on a Raymar Canvas Panel, a surface that is durable and saves me a lot of preparation time. The painting turned out well, and now that it is dry, it can be purchased online at the Small Impressions Gallery at Etsy for $50.00 plus $6.50 for shipping to US addresses. It will fit easily into a standard frame or might be displayed on a table-top easel. It is sold unframed and does not include and easel. After painting these gems, I finally broke down and ate one. Their bright color was so enticing. 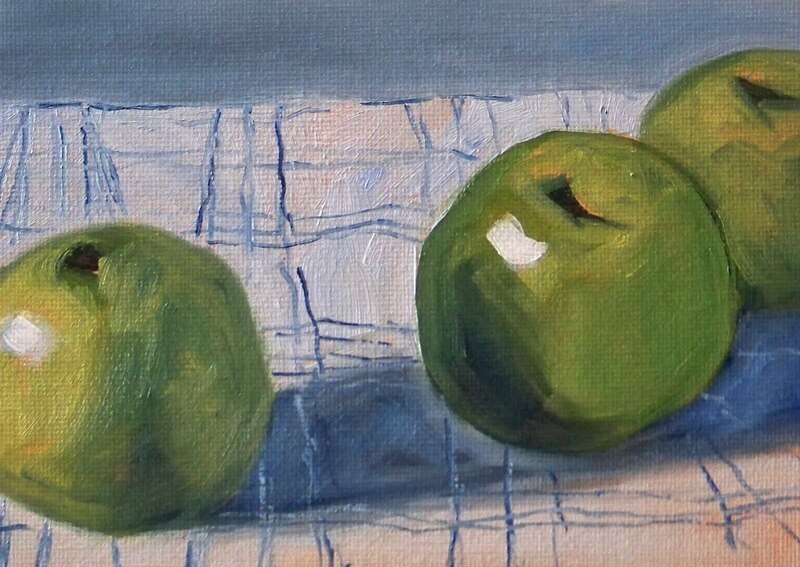 I've been on an apple painting stint lately, so next time I go to the produce stand, I'm going to have to pick another fruit or vegetable. As always, I'm attracted by the beautiful colors of the fresh fruits and vegetables and am looking forward to my next visit. 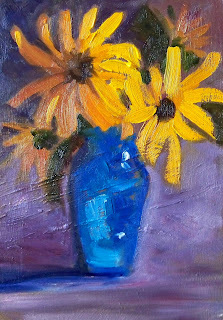 This painting is 5x7 inches on a Raymar Panel. A trip to the fruit stand in the pouring rain resulted in a day of painting yellow apples. The apples were such a luscious color, I couldn't help myself. This painting is the result of one of my efforts. 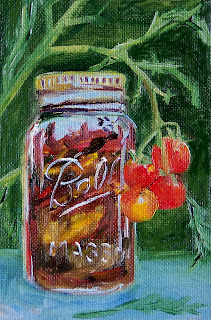 It is 5x7 inches on a Raymar panel. In a week or two it will join some of my other small format still life oil paintings at my online gallery, Small Impressions. It has been raining for a week and a wind/rain storm is predicted this afternoon. I need a little sunshine, so I painted sunflowers. I'm looking forward to an end to the drizzle gray. Hiding in my studio and painting sunny ideas is where I plan to spend my day. The painting is 5x7 inches on a hardboard panel. Today's painting resulted from a new contraption I created for painting still life. Frustrated by always looking at my stubjects from the same perspective, I found a sturdy tripod at goodwill and positioned a platform on it. I can arrange my subjects on the platform and the tripod enables moving it up and down, thus changing the perspective. 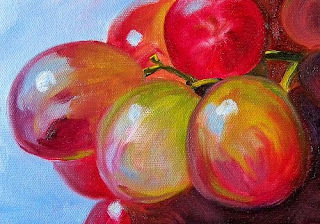 This painting is just one of several I painted using my new still life contraption. The painting is 5x7 inches on a canvas panel. Although this painting is a pretty traditional perspective, I'm looking forward to experimenting with other perspectives.